Radishes are in, so it is time to preserve some of the harvest. This recipe works well as either a fridge pickle or a water-processed canned pickle. If you plan on water-processing, cut the radishes on the thick side to preserve their crunch. Wash the radishes, trim off the tops, the bottoms, and any blemishes or discolorations. 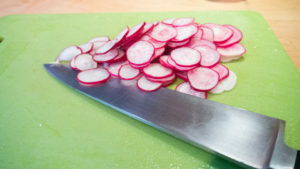 Using a chef’s knife, thinly slice the radishes into rounds (If you plan on preserving these with a water bath or pressure cooker, make the rounds thicker). Toss with 1 tsp. kosher salt and place in a colander to sweat while you make the brine. Make the brine: In a small saucepan, combine the vinegar, water, maple syrup or sugar and salt. Bring the mixture to a boil, then turn off the heat. Rinse the radishes under cold water and pat them dry. Have two 8 oz jars and lids washed and ready (if you are using a water bath, put the lids and cans in a pot of water and bring to a boil, keep them there until you are ready to pack your pickles). 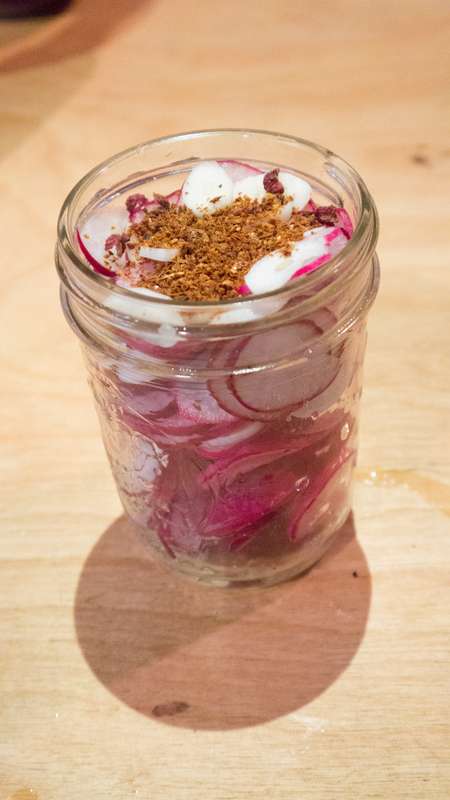 Fill each jar with radishes and top with the dry spices. Press gently with a clean wooden spoon to pack everything lightly, then cover with the hot brine. For fridge pickles, top the jar with a lid, cool to room temperature, and refrigerate for 2-3 days to allow the flavors to meld. 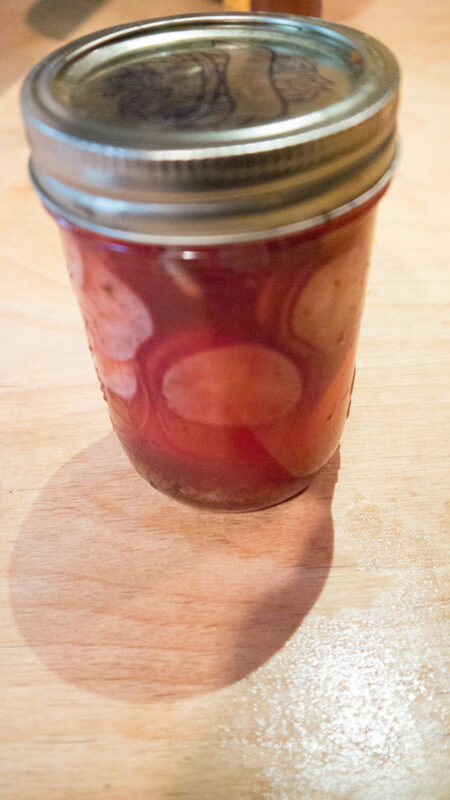 For processed pickles, leave 1/4″ head space at the top of the jar when filling with brine. Press gently to expel any trapped air, then place a lid and a ring on the can. Water process in boiling water for 20 minutes. Remove and let cool (you should hear the lids *tink* as the vacuum seal sets while they cool). Store in a cool, dark place for at least a week. Refrigerate after opening.